The Detox Prescription is a cleanse plan for better health, greater energy, and efficient weight loss. It has been carefully designed to help you undo the damage from years of toxin exposure and to release accumulated toxicity. The author Dr. Woodson Merrell, MD states that this program is also a crash course in optimal nutrition. You will learn how to nourish your body with the phytonutrients and antioxidants it needs for detoxification and optimal health. The Detox Prescription begins with a thorough explanation of what toxins are and how they may be negatively affecting your health. You will undertake two self-administered tests to determine your toxicity so you can decide how serious the problem is. Then it is up to you how long and how intensely you want to cleanse. The plan outlined in the Detox Prescription helps you eliminate toxins and adopt healthful eating behaviors. You can achieve results in just three days and the benefits will continue over 7 to 21 days. This is the first step of the program and involves a liquid diet where you will consume only juices, smoothies and nut milks. You may lose one or two pounds in this cleanse. It will also kick-start your energy levels and rapidly reduce systemic inflammation. Each day starts with a green smoothie or a green juice and throughout the day you will enjoy a total of five drinks. The three-day plan is also 100 percent raw. Dieters are provided with a guide to the best smoothie boosters for better flavor and to optimize their nutritional content. This plan starts with the 3-day juice and liquid cleanse. You will then continue with four more days of a vegan diet to deepen your detox results and reset your health. If you are new to vegan foods you will experience how satisfying and energizing a plant-based diet can be. In this plan you will also learn everything you need to know about beans and the best detoxifying salad dressings. You will add two more weeks of clean eating to the 7-day plan to create a full 21-day cleanse. This approach will allow you to lose weight in a sustainable way as you gain new healthy eating habits. Small portions of quality animal foods can now be added back into the diet in a controlled way. The majority of your meals will be based on fruit and vegetables. In this phase you can also incorporate desserts that offer detoxifying side benefits. Spinach, kale, broccoli, carrots, beets, tomato, avocado, papaya, pineapple, berries, hemp seeds, cashews, walnuts, coconut milk, rice protein, black beans, hummus, brown rice, buckwheat, yogurt, eggs, wild salmon, trout, sardines, shrimp, ostrich, emu, bison, olive oil. Readers are advised to undertake a brisk walk three times a week for 30 minutes. If you like you can break that up into two 15-minute increments. The book also has explanations of different exercises – such as yoga and calisthenics – that may be added. 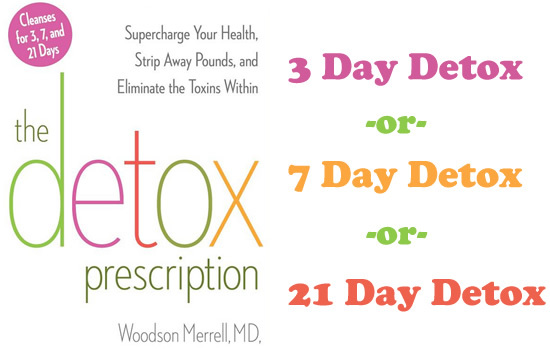 The Detox Prescription: Supercharge Your Health, Strip Away Pounds, and Eliminate the Toxins Within retails at $26.99. The program also requires the use of both a juicer and high powered blender, which may be an additional expense. The Detox Prescription can help you eliminate toxins that may be negatively impacting your wellbeing. May assist with the management of chronic health conditions. Encourages a high consumption of fresh, organic fruit and vegetables. Provides a practical introduction to a plant-based diet for those new to this way of eating. Assists with identification of toxins in your home and work environment. The Detox Prescription requires adhering to a strict diet with the elimination of wheat, sugar, coffee and alcohol. Most dieters experience detox symptoms in the initial stages such as headaches, digestive discomfort and fatigue. Organic produce may be more expensive. Involves a lot of time for food preparation and cooking. The recipes are not organized in a practical user-friendly format. The Detox Prescription offers a gentle way to cleanse your body by following a 3, 7, or 21-day plan. Following a detox diet can assist with the alleviation of chronic health problems. It may also be of benefit for those with stubborn weight gain who have not achieved success with standard low-calorie diets.